Do Collagen Drinks help to fight off skin ageing? Research studies have reported that the collagen in Rejuvenated Collagen Shots significantly improves the appearance of skin and health generally. Collagen Shots are clinically formulated functional beauty drinks to naturally support firm, youthful skin. Collagen Shots naturally supplement your skin’s collagen levels and hydration to improve its firmness and texture, reducing the appearance of fine lines and wrinkles associated with ageing. The unique and unrivalled formulation of Collagen Shots combines a blend of peptide rich amino acids with hyaluronic acid, natural antioxidants and a range of vitamins and minerals clinically proven to improve the tone and texture of the skin. Compared to rival products, Collagen Shots contain more hydrolysed collagen (10,000mg/serving) see Figure 1 below, are entirely natural, and incorporate the powerful natural antioxidant Açaí Berry. Collagen Shots is an easy-to-drink beauty product that provides high levels of natural marine collagen to help improve the appearance and function of your skin by supporting and increasing the body’s natural collagen production. • The peptides that we use are extracted using a gentle enzymatic process to achieve a very lowlow molecular weight which is easily digested and absorbed into the blood stream. • The high bioavailability of the hydrolysed collagen enables 90-95% of the collagen peptides reach to reach the target sites in the body. • Collagen peptides stimulate fibroblasts in the skin, which increase collagen production and restore the structural integrity of the fibroblasts, promoting firmer, stronger skin. Following ingestion, nutrients pass through the stomach undergoing breakdown via enzymatic processes before reaching the small intestine. There, they are absorbed through the intestinal walls and into the blood stream and subsequently delivered to the where they are needed (or stored) in the body (Figure 2). For a supplement to be effective, it needs to have a high bioavailability, that is, it needs to be absorbed and used efficiently in the target sites of the body (Richelle et al., 2006). A significant factor effecting bioavailability is the Dalton weight of a molecule. The smaller the Dalton value, the greater the absorption into the blood stream and uptake at cellular level, which equates to higher bioavailability. In our natural diet, collagen has a very high Dalton weight with an average molecular weight of approximately 300,000 Da (Ohara et al., 2007) which requires a significant amount of breakdown via digestion before it is available to the body. However, hydrolysed collagen, as used in Collagen Shots, has been specially formulated to have a very low molecular weight, typically 2000 Daltons, which means it has smaller peptides and amino acids which are more easily absorbed through the enterocytes within the intestinal wall and used by the body (Iwai et al., 2005). Indeed, several studies have highlighted the high level of absorption of hydrolysed collagen into the blood stream; for example following consumption of hydrolysed collagen from cartilage, chicken feet, and porcine skin, the level of peptides in the blood rose significantly, reaching a peak 1-2 hours after ingestion (Iwai et al., 2005). Oesser et al. (1999) indicate that 90% of orally ingested hydrolysed collagen in mice was absorbed into the blood within 6 hours and high levels were evident in cartilage tissue up to 96 hours later, indicating that the collagen reached the target sites and remained available for a significant period of time after ingestion. Significantly, collagen derived from marine sources, as present in Collagen Shots, has been shown to be even more readily absorbed than other sources of collagen (Ohara et al., 2007), meaning that Collagen Shots are an excellent source of collagen that is highly bioavailable to the body. Once in the blood stream, the collagen peptides are attracted to fibroblasts in connective tissue including the skin. It is suggested that collagen peptides influence the skin by stimulating the fibroblast cells to increase production of, and reorganise, collagen fibres (Postlethwaite, et al., 1978). The result is an increase in number and diameter of the collagen fibrils in the skin, which promote the cohesion of the collagen fibres, leading to improved suppleness, elasticity and firmness of the skin, as well as improving skin hydration (Matsumoto et al., 2006). Skin hydration is also a crucial element of plump, healthy, youthful-looking skin, and collagen supplementation has been shown to enhance this considerably, which is directly associated with reduced wrinkles and lines and increased smoothness (Sumida et al., 2004). Further details are outlined in the “Can Collagen improve your skin?” section below. Can collagen improve your skin? The skin is the largest organ in the body, the most visible and arguably exposed to the greatest combined negative effects of intrinsic ageing, including reduced collagen synthesis (Fligiel et al., 2003), environmental factors such as sunlight (Chung et al., 2001) and lifestyle choices, like smoking (Rexbye et al., 2006). As we age, the appearance and functionality of the skin changes, most striking of these are wrinkles, lines, dryness and sagging skin (see Gilchrest, 1989 for review). Collagen is crucial for maintaining the structure of the skin (Uitto, 1986) and therefore, youthful radiance and firmness. Within the deep layers of the skin, cells called fibroblasts are responsible for providing skin tension and continuously producing collagen and elastin (Grinnell, 2003). In young skin, the number and productivity of the fibroblasts is high giving skin firmness and strength (Figure 3). Unfortunately, as we age the efficiency of fibroblasts in the skin reduces (see West, 1994 for review). Indeed, several studies have reported that naturally ageing skin has significantly lower collagen synthesis than young skin (Chung et al., 2001; Varani et al., 2000). Reduced collagen synthesis together with further damage to collagen structures from the sun and lifestyle factors (Kennedy et al., 2003) leads to less collagen and therefore reveals the natural signs of ageing; wrinkles, lines and loss of volume (Gilchrest, 1989). It is now well established that nutrition is a crucial element for maintaining healthy, younger looking skin (Cosgrove et al., 2007). Specifically, ingesting hydrolysed collagen as found in Collagen Shots has been shown to improve the structure, function and appearance of the skin. For example, skin hydration was improved in a group of females ingesting 10g of hydrolysed collagen every day compared to those taking a placebo (Sumida et al., 2004). Similar significant increases in collagen fibre density and diameter were accompanied by reports of significant improvements in skin condition in a study by Matsumoto et al. (2006). An observation study of women with significant age-related periorbital wrinkling (Crows feet) who ingested collagen daily for 8 weeks significantly improved periorbital wrinkling and overall facial ageing (Kantor et al., 2002). A further study compared the effects of supplementing the diet of a group of healthy women with 0 or 10g of collagen dissolved in a drink for 7 weeks and a dermatologist assessed the condition of their skin and measured the water content of the outer layer of the skin (stratum corneum) and the skin barrier function. After 3 weeks, 62% of the 10g group report improvements in skin condition compared to only 10% of the 0g group. After seven weeks the effects were even greater with 81% of the 10g reporting better skin condition compared to just 20% in the 0g group (Figure 4) (Koyama, 2009). Taken together these findings indicate that oral ingestion of collagen can have a significant effect on the structure, function and appearance of skin. 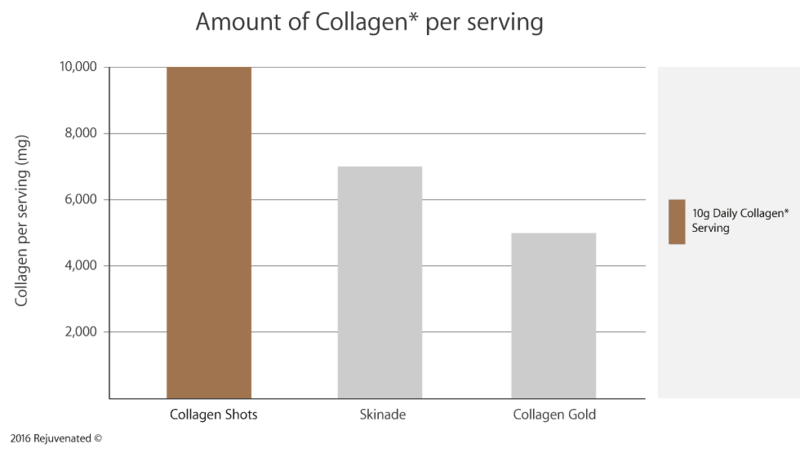 FIGURE 4 - effects of 0g and 10g of collagen ingested each day dissolved in a drink on perceived improvement in skin condition. Rejuvenated Collagen Shots is the only collagen beauty drink to use this unique source of high grade natural marine collagen* in a collagen drink. The effects of this collagen have been specifically studied in several research studies. The first study, conducted qualitatively evaluated the effect of a daily intake of 10g of the collagen used by Rejuvenated over a 4 week period in fifty-two healthy females aged 20-60 years. Participants answered a series of questions regarding the usability and effectiveness of the product during and at completion of the study period and rated the effects on various indicators of skin appearance and joint pain. The results indicated that after just two weeks of supplementation, participants reported an increase in skin firmness, hydration and brightness as well as a reduction in joint pain and these effects were improved even further following 4 weeks of taking the supplement (Figure 5). FIGURE 5 - improvements in ratings of skin appearance (firmness, hydration, & brightness) and joint pain following ingestion of 10g of collagen/day. A second, clinical study conducted by CPCAD at the Dermatology laboratory in Nice, France sought to determine the effectiveness of a daily ingestion of 10g group of collagen* dissolved in 20cl of liquid daily for 12 weeks compared to a placebo product in 40 healthy female participants aged between 54 and 64. Would you say that the collagen treatment you underwent has reduced the wrinkles on your face? Would you say that the treatment you underwent is globally effective in reducing signs of aging in the face? The results of the study reported significant skin smoothing in the periorbital area and a significant reduction (- 9.37%) in wrinkling in this area i.e. reduced appearance of “Crow’s feet” (Figure 6). 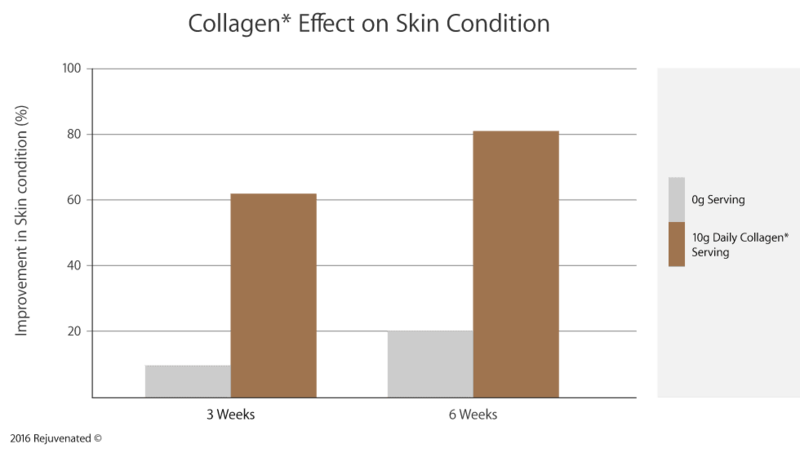 FIGURE 6 - Form factor in skin relief (smoothness) in the periorbital area following 12 weeks supplementation with 10g/day collagen. Additionally, skin hydration was found to be significantly improved following 6 weeks of supplementation and showed further improvements of 22.8% after 12 weeks compared to baseline measures(Figure 7). Furthermore, skin elasticity was also significantly increased after 12 weeks by 27.2% (Figure 8). No significant effects were seen in the placebo groups for any skin measures. 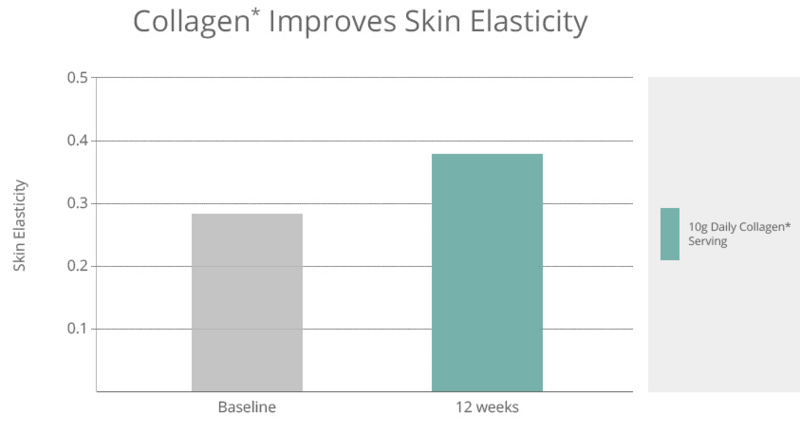 FIGURE 7 - Improvements in skin hydration following 12 weeks supplementation with 10g/day collagen. 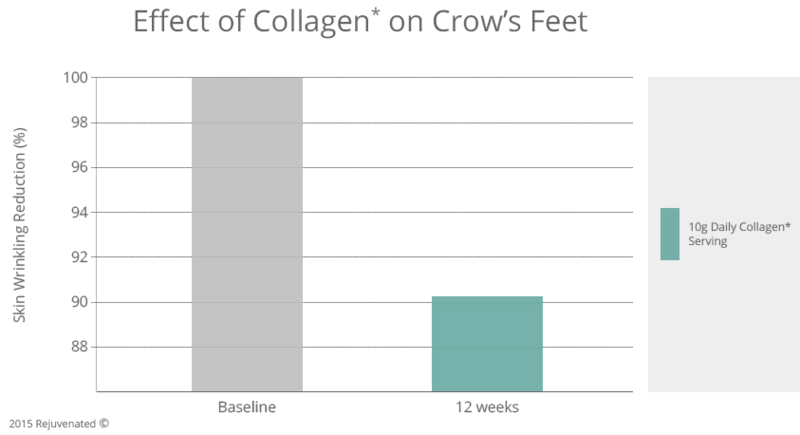 FIGURE 8 - improvements in skin elasticity following 12 weeks supplementation with 10g/day collagen. “Would you say that the collagen treatment you underwent has reduced the wrinkles on your face?” compared to just 15% in the placebo group. The effects were even greater after 12 weeks with 79% of participants in the collagen group responding positively compared to just 58% in the placebo group (Figure 9). FIGURE 9 – reduction in skin wrinkle appearance following 12 weeks supplementation with 10g/day collagen. Collagen, specifically type I collagen, is not just part of skin, it is the largest and most abundant protein in the body, making up about a third of all the protein in the body (Di Lullo et al., 2002). Collagen is predominately found in the connective tissue of the body, and due to its strong fibrous structure is an integral support element for muscles, bones and ligaments. It is also a crucial protein for good joint health. Collagen also provides strength to certain body parts, such as nails and is important for strong, healthy hair. As discussed above, as we age, our ability to produce collagen reduces significantly and therefore supplementation with a highly bioavailable hydrolysed collagen product such as Collagen Shots can be highly beneficial to the whole body. Studies have found that collagen can help reduce pain, swelling and stiffness of the joints (Bruyère et al., 2012) and may be especially beneficial for those with rheumatoid arthritis (Barnett et al., 1998). Studies have shown that ingested collagen positively affects joints by improving the density of the cartilage in the joints (McAlindon et al., 2011). Collagen supplementation may improve the flexibility and mobility (Moskowitz et al., 2000; Carpenter et al., 2005), which is especially important for maintenance of an active and healthy lifestyle. A major constituent of the structure of blood vessels is collagen, and ingestion of gelatin has been shown to increase the elasticity of blood vessels and blood flow to the finger, increasing the finger volume (Kadison, 1965). Increased blood vessel elasticity may help to reduce the risk of hardening of the arteries and associated heart diseases (McEniery et al., 2007). A healthy circulation and the increased finger volume associated with the gelatin ingestion (Kadison, 1965) may help to boost the radiance and fullness of the skin. Collagen is an important element for healthy, strong hair growth. Supplementation with collagen for 62 days resulted in an increase in the thickness and strength of the hair and once the supplementation ceased hair thickness returned to its original level (Scala et al., 1976). As with hair, collagen is an integral part of strong, healthy nails. Research has shown that supplementing individuals with brittle nails with 7g collagen a day reported that 86% of participants saw improvement in the quality of their nails and when the collagen supplement ended the nail defects returned (Rosenberg et al., 1957). Similarly, in a second study, 80% of subjects saw improvement in their nails after taking collagen peptide (Schwimmer & Mullnos, 1957). Following fractional photothermolysis treatment, half the patients received 3g of collagen peptide each day for 4 weeks. The results showed that by day three, those taking the collagen had significantly better skin hydration. Furthermore, by day 14, skin elasticity had improved significantly in these patients compared to a control group (Choi et al., 2014). It is well established that hydrolysed collagen is very effective at suppressing appetite, and therefore supplementation may aid weight loss (Martin, 2001). From an anecdotal perspective, many Collagen Shots customers have reported improvements in many of the above factors as well as in their skin, giving even more reason to include Collagen Shots into your daily health and beauty regime. Collagen Shots provide all the benefits of collagen in an easy to prepare, easy to drink formula. Freeze drying the enables 10,000mg marine collagen to be packed into each serving, an amount that would be impractical to achieve in tablet form. In comparison to collagen products applied directly to the skin, Collagen Shots have several distinct advantages. The skin is a multi-layer protection system for the body with the thick stratum corneum being the outer most of these. The fibroblasts that are central to the promotion of healthy skin are located in the dermis which is situated deep below the layers of the epidermis (Figure 10). The skin is specifically designed to prevent unwanted things to cross through it and enter the body. Therefore, collagen creams applied to the skin need to have a very small molecular size in order to reach the active fibroblasts in the dermis. Research suggests that to enter the body via the skin, molecules need to be less than 500 Daltons in size (Bos & Meinardi, 2000). As discussed above, even hydrolysed collagen has a molecular weight of approximately 2000 Daltons. Therefore, it is unlikely that the collagen in creams applied to the skin would be able to cross the skin-body border and reach the fibroblasts. Indeed, if they were able to cross the skin-body barrier and enter the circulation, they would need to be registered and tested a medical product. In contrast, the hydrolysed collagen as found in Collagen Shots has been shown to pass through the intestinal wall into the blood (Iwai et al., 2005) in humans with a 90% of ingested collagen reaching the target cells in mice (Oesser et al. 1999). A 2009 study by Koyama, reported significant reports of improved skin condition following collagen supplementation with 5g and 10g daily, but there was no difference in the water content or barrier function of the skin compared to the control group. These findings suggest that the effect of collagen is located in the deep dermis layer of the skin, where creams are unlikely to reach. Rejuvenated Collagen Shots have been especially formulated with 10,000 mgs of marine collagen, hyaluronic acid and the super antioxidant Açaí berry combined with vitamins B3, B5, C with minerals zinc and copper to optimise the use of collagen in the body and provide a whole range of further health benefits. A significant contributing factor to the ageing process and aging skin is the production of free radicals ad subsequent oxidative stress in response to factors such as UV radiation, smoking and pollution. Açaí Berry: has been proclaimed as a ‘Super Food’ and with a 19 amino acid profile and an array of vitamins (A, B1, B2, B3, C and E) Açaí Berry is an exceptional antioxidant. Research in humans has shown that antioxidant capacity following a single 7ml/g body weight dose of Açaí pulp increased up to 3 times of a placebo (Mertens-Talcott et al., 2008). A reduction in oxidative stress has been proposed as crucial in maintaining normal metabolism and reducing the risk of conditions such as diabetes and cardiovascular disease (Grattagliano et al., 2008). The most prominent fatty acid in Açaí Berry, contributing 56.2%, is oleic acid, followed by followed by palmitic at 24.1%, and linoleic acid contributing 12.5% (Schauss et al., 2006). Oleic Acid has been suggested to have modulating effects of many physiological functions, to improve immune function, and may be beneficial against several inflammatory diseases and cancer (see Sales-Campos et al., 2013 for review). Research in rats suggests that Palmitic acid may act as an antioxidant and potentially contribute to the prevention atherosclerosis (Cho et al., 2010). Finally, animal research suggests that Linoleic acid may help prevent heart disease and cancer, and studies with humans have provided convincing evidence for its role in reducing body fat (see McCrorie et al., 2011 for review). Hyaluronic Acid: has often been called the fountain of youth as it contributes to the plumpness of well hydrated skin. One of the most abundant elements of the skin is water and crucial to retaining the skins moisture is a mucilaginous mucopolysaccharide macromolecule called hyaluronic acid (Baumann, 2007). Hyaluronic acid is made by the body, but as with collagen, its production decreases with age (Longas et al., 1987) and its loss contributes to the dry, inflexible and saggy skin associated with older age. Ingestion of collagen has been shown to enhance the production of hyaluronic acid, due to its stimulation of the fibroblast cells in the dermis (Ohara et al., 2010). Vitamin C (Ascorbic acid): is an essential vitamin that not only protects the body against oxidative stress but is also essential for collagen production in the body (Peterkofsky, 1991). As we age, the levels of Vitamin C in both the epidermis and dermis of the skin fall (Rhie et al., 2001) and thus for the collagen provided in Collagen Shots to be optimally effective the inclusion of adequate Vitamin C in the product is vital. In addition, Vitamin C also increases the growth and production of fibroblast cells which as discussed preciously are central to healthy skin, and as this fibroblast proliferation declines with age, maintaining adequate Vitamin C is very important (Phillips et al., 1994). Observational research has also associated higher Vitamin C intakes with better skin condition and a noticeable reduction in wrinkles (Cosgrove et al., 2007; Purba et al., 2001). Where do you source your fish? The fish used for Collagen Shots is sustainably sourced from free running fresh water to ensure that they are low in sodium and eliminate the potential for mercury contamination. The fish is of European origin. The types of fish are white flesh, such as perch, tilapia and carp. Why are Collagen Shots formulated as a powder? By using freeze dried ingredients you can be assured of 100% potency overtime you drink Collagen Shots. Currently there is not a recognised method of putting such formulas into a ready made drink without heat treating the ingredients to pasteurise them, it's believed this process can affect the potency of collagen and vitamin C.
Barnett, M.L., Kremer, J.M., St. Clair, E.W., Clegg, D.O., Furst, D., Weisman, M., Fletcher, M.J., Chasan-Taber, S., Finger, E., Morales, A., Le, C.H. & Trentham, D.E. Treatment of rheumatoid arthritis with oral type II collagen: results of a multicenter, double-blind, placebo-controlled trial. Arthritis and Rheumatism. 1998; 41:290–297. Baumann, L. Skin ageing and its treatment. J Pathol. 2007 Jan; 211(2):241-51. Bruyère, O., Zegels, B., Leonori, L., Rabenda, V., Janssen, A., Bourges, C. & Reginster, J.Y. Effect of collagen hydrolysate in articular pain: a 6-month randomized, double-blind, placebo controlled study. Complement Ther Med. 2012; 20(3):124-30. Carpenter, R.L., Peel, J.B., Carpenter, M.R., Lowndes, J., Angelopoulos, T.J. & Rippe, J.M. Effectiveness of a collagen hydrolysate-based supplement on joint pain, range of motion and muscle function in individuals with mild osteoarthritis of the knee: a randomized clinical trial. Ann Rheum Dis. 2005;64: 1544. Choi, S.Y., Kim, W.G., Ko, E.J., Lee, Y.H., Kim, B.G., Shin, H.J., Choi, Y.S., Ahn, J.Y., Kim, B.J. & Lee, H.J. Effect of high advanced-collagen tripeptide on wound healing and skin recovery after fractional photothermolysis treatment. Clin Exp Dermatol. 2014; 39(8):874-80. Cosgrove, M.C., Franco, O.H., Granger, S.P., Murray, P.G. & Mayes, A.E. Dietary nutrient intakes and skin-aging appearance among middle-aged American women. Am J Clin Nutr. 2007; 86:1225-1231. Di Lullo, G.A., Sweeney, S.M., Körkkö, J., Ala-Kokko, L. & San Antonio, J.D. Mapping the Ligand-binding Sites and Disease-associated Mutations on the Most Abundant Protein in the Human, Type I Collagen. J Biol Chem. 2002; 277(6):4223-4231. Fligiel, S., Varani, J., Datta, S., Kang, S., Fisher, G. & Voorhees, J. Collagen degradation in aged/photodamaged skin in vivo and after exposure to matrix metalloproteinase-1 in vitro. J Invest Dermatol. 2003;120:842–848. Gilchrest, B.A. Skin aging and photoaging: an overview. J Am Acad Dermatol. 1989; 21:610–3. Grattagliano, I., Palmieri, V.O., Portincasa, P., Moschetta, A. & Palasciano, G. Oxidative stress-induced risk factors associated with the metabolic syndrome: a unifying hypothesis. J Nutr Biochem. 2008; 19:491-504. Grinnell, F. Fibroblast biology in three-dimensional collagen matrices. Trends Cell Biol. 2003; 13(5):264-9. Iwai, K., Hasegawa, T., Taguchi, Y., Morimatsu, F., Sato, K., Nakamura, Y., Higashi, A., Kido, Y., Nakabo, Y. & Ohtsuki K. Identification of food derived collagen peptides in human blood after oral ingestion of gelatin hydrolysates. J Agric Food Chem. 2005; 53:6531–6536. Kajimoto, O., Odanaka, W., Sakamoto, W., Yoshida, K., Takahashi. Clinical effects of Hyaluronic Acid Diet for Dry Skin. J New Reme & Clinics. 2001; 50(5): 548-560. Kantor, I., Donikyan, L., Simon, R., & Wollschlaeger, B. Results of a study evaluating the use of a dietary supplement formula in the management of age-related skin changes in women with moderate to severe wrinkling of the periorbital area. JANA. 2002; 5(2):10-19. Koyama, Y. 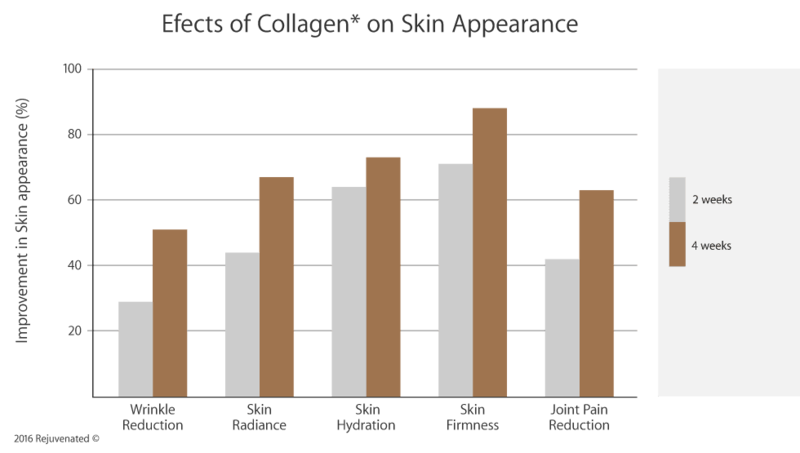 Effects of collagen peptide ingestion on the skin. Shokuhin-To-Kaihatsu. 2009:44:10-12. Longas, M.O., Russell, C.S. & He, X.Y. Evidence for structural changes in dermatan sulfate and hyaluronic acid with aging. Carbohydr Res. 1987; 15: 159(1):127-36. Martin, A. (2001). 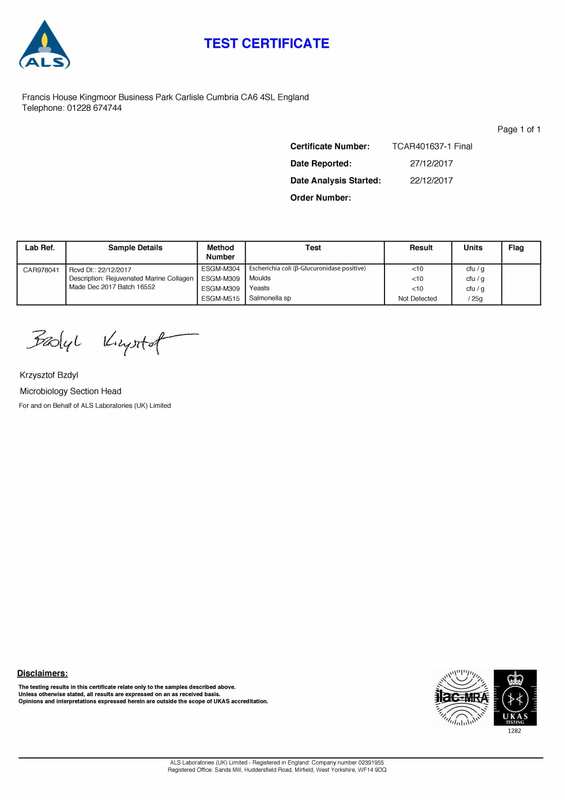 Advanced nutritional intakes (Ed.) Tec. & Doc, Paris. Matsuda, N., Koyama, Y., Hosaka, Y., Ueda, H., Watanabe, T., Araya, T., Irie, S. & Takehana, K. Effects of ingestion of collagen peptide on collagen fibrils and glycosaminoglycans in the dermis. J Nut Sci & Vitaminol. 2006; 52:211-215. Matsumoto, H., Ohara, H., Ito, K., Nakamura, Y. & Takahashi, S. Clinical effect of fish type I collagen hydrolysate on skin properties. ITE Lett Batteries New Technol Med. 2006;7:386-390. McCrorie, T.A., Keaveney, E.M., Wallace, J.M.W., Binnsa, N., Livingstone, M. B. E. Human health effects of conjugated linoleic acid from milk and supplements. Nutr. Res. Rev. 2011; 24:206-227. McEniery, C.M., Wilkinson, I.B. & Avolio, A.P. Age, hypertension and arterial function. Clin Exp Pharmacol Physiol. 2007; 34(7):665-71. Mertens-Talcott, S.U., Rios, J., Jilma-Stohlawetz, P., Pacheco-Palencia, L.A., Meibohm, B. & Talcott, S.T. Pharmacokinetics of anthocyanins and antioxidant effects after the consumption of anthocyanin-rich acai juice and pulp (Euterpe oleracea Mart.) in human healthy volunteers. J Agric Food Chem. 2008; 56:7796-7802. Miller, E.J. Biochemical characteristics and biological significance of the genetically distinct collagens. Mol Cell Biochen. 1976; 13:165-192. Moskowitz, R.W. Role of collagen hydrolysate in bone and joint disease. Semin Arthritis Rheum. 2000; 30:87 - 99. Oesser, S., Adam, M., Babel, W. & Seifert, J. Oral administration of (14)C labeled gelatin hydrolysate leads to an accumulation of radioactivity in cartilage of mice (C57/BL). J Nutrition. 1999; 129:1891-1895. Ohara, H., Ichikawa, S., Matsumoto, H., Akiyama, M., Fujimoto, N., Kobayashi, T. & Tajima S. Collagen-derived dipeptide, proline-hydroxyproline, stimulates cell proliferation and hyaluronic acid synthesis in cultured human dermal fibroblasts. J Dermatol. 2010; 37(4): 330–338. Ohara, H., Matsumoto, H., Ito, K., Iwai, K. & Sato, K. Comparison of quantity and structures of hydroxyproline-containing peptides in human blood after oral ingestion of gelatin hydrolysates from different sources. J Agric Food Chem. 2007; 55:1532–1535. Peterkofsky, B. Ascorbate requirement for hydroxylation and secretion of procollagen: relationship to inhibition of collagen synthesis in scurvy. Am J Clin Nutr. 1991; 54:1135S-1140S. Phillips, C.L., Combs, S.B. & Pinnell, S.R. Effects of ascorbic acid on proliferation and collagen synthesis in relation to the donor age of human dermal fibroblasts. J Invest Dermatol. 1994; 103:228-232. Postlethwaite, A.E., Seyer, J.M., and Kang, A.H. Chemotactic attraction of human fibroblasts to type I, II, and II collagens and collagen-derived peptides. Proceedings of the National Academy of Sciences of the United States of America. 1978; 75(2): 871-875. Purba, M.B., Kouris-Blazos, A. & Wattanapenpaiboon, N. Skin wrinkling: can food make a difference? J Am Coll Nutr. 2001; 20:71-80. Rexbye, H., Pettersen, I., Johansen, M., Kiltkou, L., Jeune, B. & Christensen, K. Influence of environmental factors on facial ageing. Age & Ageing. 2006; 35:110-115. Rhie, G., Shin, M.H. & Seo, J.Y. Aging- and photoaging-dependent changes of enzymic and nonenzymic antioxidants in the epidermis and dermis of human skin in vivo. J Invest Dermatol. 2001; 117:1212-1217. Richelle, M., Sabatier, M., Steiling, H. & Williamson, G. Skin bioavailability of dietary vitamin E, carotenoids, polyphenols, vitamin C, zinc and selenium. Br J Nutr. 2006; 96(2):227–238. Rosenberg, S., Oster, K.A., Kallos, . & Burroughs, W. Further studies in the use of gelatin in the treatment of brittle nails. Arch Dennat and Syph. 1957; 76:330-5. Sales-Campos, H., Souza, P.R., Peghini, B.C., da Silva, J.S. & Cardoso, C.R. An overview of the modulatory effects of oleic acid in health and disease. Mini Rev Med Chem. 2013; 13(2):201-10. Schauss, A.G., Wu, X., Prior, R.L., Ou, B., Patel, D. & Huang, D. Phytochemical and nutrient composition of the freeze-dried amazonian palm berry, Euterpe oleraceae mart. (acai). J Agric Food Chem. 2006; 54:8598-8603. Schwimmer, M. & Mullnos, M. Salutary effects of gelatin on nail defects in normal subjects. Antibiotic Med & Clin Ther.. 1957; 4:403-7. Sumida, E., Hirota, A. & Kuwaba, K. The effect of oral ingestion of collagen peptide on skin hydration and biochemical data of blood. J Nutr Food?. 2004;7:45-52. Uitto, J. Connective tissue biochemistry of the aging dermis. Age-related alterations in collagen and elastin. Dermatol. Clin. 1986; 4:433–446. Varani, J., Warner, R.L. & Gharaee-Kermani., M. Vitamin A antagonizes decreased cell growth and elevated collagen-degrading matrix metalloproteinases and stimulates collagen accumulation in naturally aged human skin. J Invest Dermatol. 2000; 114:480–486. West, M.D. The cellular and molecular biology of skin aging. Arch Dermatol. 1994; 130(1):87-95.